A weblog by Greg Williams, K4HSM discussing mostly amateur radio and FCC issues. According to reports, RadioShack is about to file for Bankruptcy, selling 1/3 of it's stores to Sprint Corporation, the remaining stored being liquidated. The bankruptcy filing may occur as soon as just a few hours, ending a legacy that was both a resort for ham operators and experimenters and a near-parody of its former self by moving away from its radio, computer, and maker roots and gravitating towards cell phone sales and satellite TV and radio that focused less on the tech and more on the bottom line. RadioShack Corp. is closing in on an agreement with creditors and other parties that would put the retailer in bankruptcy as soon as Wednesday night or Thursday morning, people with knowledge of the discussions said. As part of the deal being completed, RadioShack would sell leases on as many as 2,000 stores to Sprint Corp. and Standard General, its largest shareholder, according to the people, who asked not to be identified because the talks are private. The rest of the electronics chain’s more than 4,000 U.S. locations are expected to be closed, the people said. The filing could be delayed as the parties hammer out final details. I was in RadioShack this past weekend and went to almost all of the stores in Knoxville, seeing what was left as many of the stores clearanced out their inventory (I think they shipped their scanners to stores that were surviving) and many of the stores were already picked through. I would still patronize the stores (albeit less frequently over time) and the way the stores looked in the 1980's versus the 2000's are like apples and oranges. I can remember going to West Town Mall and walking into the back of the store and tinker with the TRS-80's (affectionately called "Trash-80's") that were on sale. I'd have loved to own one, but the $2500 price tag (in 1980's dollars, remember) was beyond my price range, or that of many people I knew. One time I was in the mall and my mother turned me loose in Radio Shack (back when it was TWO words) while she looked for boring stuff in other stores (clothes...UGH...what boy under 14 wanted to shop for THAT?) and I spent 2 hours playing a poker and blackjack on a TRS-80. I got so involved (and no salesman could try to sell anything to a 12-year-old kid) that eventually my mother came up to me yelling "WHERE THE HELL HAVE YOU BEEN?!?!?!?". She apparently had been madly searching for me all over the mall for about an hour, and because I had been in the back corner of the Radio Shack, out of view of anyone looking in from the mall entrance, she'd thought I had taken off to the arcade (another favorite hangout of mine) and when I wasn't at either place she panicked. I think she was 10 steps from calling the cops, because if she hadn't taken those 10 steps to the back of the store, then I am certain that my face would have ended up on milk cartons. Playing with that TRS-80 got me into computers. Playing with Apple II's in school furthered that addiction. 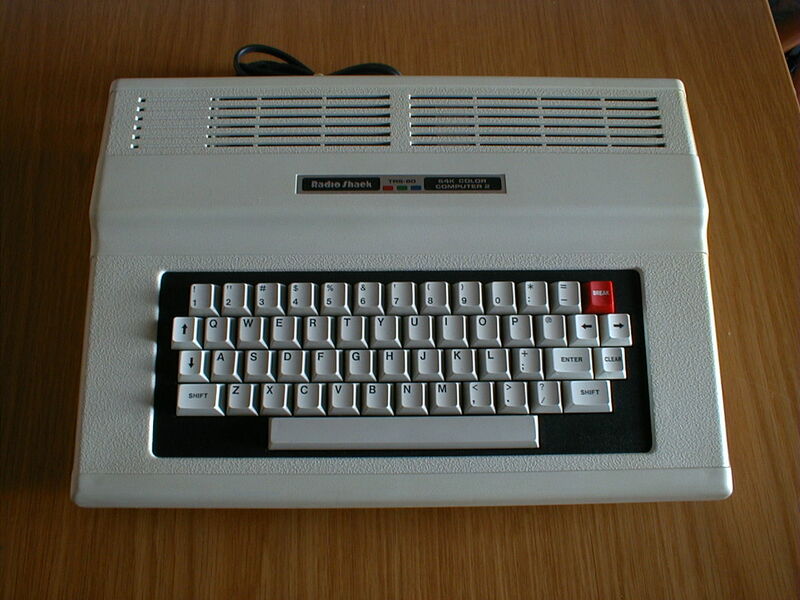 One Christmas, Santa Claus got us a TRS-80 Color Computer II. It was, for me at least, a dream come true. I spent my Christmas vacation in Speedwell, TN at my grandparents house toying with that "CoCo" on my "monitor", a new color TV, a glorious Zenith 12" with wood paneling and rabbit ears. The whole time I was in Speedwell, I think I was in the upstairs attic/bedroom learning BASIC programming on that thing. And if I rebooted or turned it off, everything I worked on for HOURS was gone...because there was no storage device. There were no hard drives in the CoCo, and if I wanted to save anything, a cassette tape drive was over $100. I mainly used it for playing cartridge games and tinkering with BASIC. Over the years, I would visit whenever we made a trip to the mall, and when I got my driver's license, the visits got more frequent. When I had a technical issue, almost every employee had an answer that was right. They knew their stuff, and they were helpful. When I got interested in ham radio, my first rig was an HTX-202 2 meter radio. I had a minor run-in with a couple of RadioShack employees while I was waiting to get my license in the mail (this was in 1993, right before they had electronic filing and fast turnarounds. I was waiting for 2 months before I got my license). While I was looking over an HTX-202, one of the salespeople said that I couldn't purchase a radio until I was able to show my license, so that they could verify I was using it legally. He did let me put it on layaway, which I was planning to do anyway since I didn't have the entire $199 to buy it. As I waited...and waited...........aaaaand waited for my license in the mail, I went to a meeting at the local radio club and met some new friends. As we talked, I mentioned I was waiting to get my license so that I could get my HTX-202 out of layaway, and when they asked why, I told them what I was told. All of them hit the roof, wondering who in the hell would tell me that. It turns out I could buy a ham radio whenever, I just couldn't transmit on one. Maybe it was misunderstanding on my part, or on the salesperson's part, but they all wanted to raise tee-total hell on whoever would keep me from getting a radio. I tried to keep it low-key and said not to worry about it. When I FINALLY got my license in the mail, I headed to Radio Shack to get my new rig. When I approached the salesperson and asked to pick up my radio, he mumbled "Oh...it's YOU!" and ran to the back. I still to this day don't know how he meant it, if it was because somebody called and chewed the store manager out, or if the guy remembered me putting it in layaway. Or both. of times I begged for one. I've owned 3 Radio Shack rigs over the years. A mobile 2-meter (HTX-212) rig and the HTX-10 10-meter rig. All of them have been rock-solid and worth the money I paid (either retail or hamfest prices) and they were true workhorses. Unfortunately, it was in the mid-90's when things changed drastically for "the Shack". When I was a kid, I remember getting a catalog and all the gadgets and gizmos were amazing to look at. I can remember putting so many products on my wish list for Christmas. A remote controlled tank, an electronics experimenter's kit (to make an AM radio! 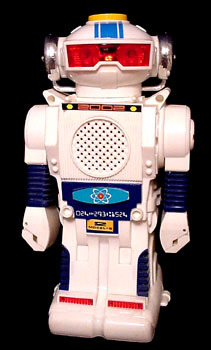 ), the talking Atomic Robot, all sorts of electrical toys and products to waste time with, and over the years, the experiment toys and gadgets went away one at a time. Toys to tinker with trickled down. As I would come into a store to look for parts for my ham radio addiction, the knowledge level of some salespeople drastically declined. Case in point: I needed RG-58 coax for my mobile and asked the salesperson where the "coax" (as in, co-AXE) was, and he had the "deer in headlights" stare and asked me what I needed an axe for. I said "no, coaxial CABLE" and he directed me to where the cable was. And he tried to sell me on RG-59 (cable TV coax) and I said "no, I need RG-58 for my ham radio" and he tried to sell me on the RG-59 "because it was a later version". Who knew that coaxial cable could be upgraded to new versions?!?!? Over the years, the questions I would ask about solder, connectors, and antennas would go unanswered, except by the occasional employee who either was a ham themselves or was in college at a technical institute to earn a degree, and they were the diamonds in the rough. The ones that didn't know would just try to turn the conversation into a sales pitch for a cell phone or Sirius radio. I would often leave in disgust because they went from "You got questions, we got answers" to "You got q...BUY THIS PRODUCT YOU DON'T NEED!" As I made my rounds in the different RadioShack stores last weekend, it was obvious the situation from the way that the store looked, to the way the employees behaved. There was a sense of unattached attitudes and the salespeople didn't seem to want to be there. Don't get me wrong, others were helpful, in that way that Wallace Hartley and his band played "Nearer, My God, to Thee" as the Titanic sank in the cold north Atlantic. I did purchase some items that were being clearanced out. I have a mount for a mast on the side of the house and some scanner items, such as an antenna and a programming cable for one of my handhelds. I even picked up a mini-RC helicopter I've been torturing the dogs with around the house. So as I wrap this up, let me just say that it was a great store for tech geeks and makers to get their goods and at an affordable price. Mostly. Unless you wanted a TRS-80 in 1980, that is. Otherwise, they were good to go to in a pinch for spare parts and stuff you already knew you needed. Also, police scanners had a business thanks to RadioShack. I hope to catch a sweet deal on a digital scanner but I'm not holding my breath. I think that the "high end" stuff got moved to the stores that weren't currently closing. But I'll keep looking, being the vulture that I am. The view, taken via a quadcopter RC remote, gives an amazing view of what it's like climbing a (now defunct analog) TV tower in South Dakota to change a light bulb. Even though the tower is no longer used since the FCC made the mandatory change to digital from analog and leaving some TV transmitter towers simply landmarks until they can either be torn down or get a new tenant, the lighting has to be maintained in order to comply with FCC and FAA regulations so that aircraft aren't at risk. It's a pretty neat video. They did an amazing job filming a job that takes a lot of "moxie" to do. I hope they pay him well. If that weren't impressive, the company that filmed this also filmed a 300' tower being taken down in Jackson, MN from ABOVE the tower. I'd like to know how in the world that they were able to film sound without the propeller noise drowning out everything?